﻿The Alaskan Klee Kai breed was developed in Alaska by Linda Spurlin beginning in the 1970‘s. What began as an 'Oops' moment (Spurlin observed the result of an accidental breeding between an Alaskan Husky and an unknown small breed dog) resulted in inspiring Spurlin to pursue a new breed. Several breeds were used in creating this breed, including both the Siberian and Alaskan Huskies, the Schipperke and the American Eskimo Dog. However, the Alaskan Klee Kai has been breeding true since 1988. The original name for this breed was simply Klee Kai, however, politics took hold and the breed split into Alaskan Klee Kai and Klee Kai in 1995 for political reasons. The Alaskan Klee Kai is also known as the AKK, Miniature Alaskan Husky and Mini Husky. The Alaskan Klee Kai breed was created to provide a smaller companion version of the Alaskan Husky. They are currently recognised by the UKC, ARBA, CKC, NKC, APRI, ACR and the DRA. The Alaskan Klee Kai can come in 3 different sizes; Toy, Miniature and Standard. They can weigh anywhere from under 10 lbs to 23 lbs depending on whether they are Toy, Miniature or Standard breeds. Their height will range from under 13 inches for Toy to 17.5 inches for Standard and can fall anywhere in between. ﻿The Alaskan Klee Kai has a double coat and is sufficient in length to give a well furred experience. However, should the coat distort the outline of the dog, it is considered a breed fault. Accepted colors for the Alaskan Klee Kai’s coat are black and white, gray and white, or the more rare red/cinnamon and white. It is possible to come across a solid white Alaskan Klee Kai, however, this is a show disqualification and a white Alaskan Klee Kai is not eligible for registration. The Alaskan Klee Kai blows its coat twice a year, however, when it isn't blowing its coat, the Klee Kai does not require much grooming. The Alaskan Klee Kai tend to be a little 'dog aggressive' if not socialized properly. It is truly wise to begin socialization as soon as you get your Alaskan Klee Kai. The Alaskan Klee Kai is not recommended for living situations with small animals such as birds, rabbits or gerbils unless they are raised with them. This is due to the strong prey drive that is present in this breed. If they are not socialized well with small animals from a young age, they will have the propensity to hunt and kill them. They are also not recommended for homes with small children. They do not take well to the typical antics of babies and toddlers, such as pinching, poking and pulling and may respond by nipping at the child. The Alaskan Klee Kai tend to be a little 'dog aggressive' if not socialized properly. It is truly wise to begin socialization as soon as you get your Alaskan Klee Kai. The Alaskan Klee Kai is not recommended for living situations with small animals such as birds, rabbits or gerbils unless they are raised with them. This is due to the strong prey drive that is present in this breed. If they are not socialized well with small animals from a young age, they will have the propensity to hunt and kill them. They are also not recommended for homes with small children. They do not take well to the typical antics of babies and toddlers, such as pinching, poking and pulling and may respond by nipping at the child. ﻿The Alaskan Klee Kai is a part of it’s pack. They require a good amount of face time with their owners and would prefer to follow them wherever they go. However, the AKK is cautious and will not immediately warm up to strangers or unfamiliar situations. They do have wonderful watchdog potential, as they are extremely loyal and alert as well as prone to barking. The Alaskan Klee Kai can become a high strung dog without the right level of activity. You can find Mini Husky puppies priced from $500 USD to $3000 USD with one of our credible breeders. Browse through our breeder's listings and find your perfect puppy at the perfect price. 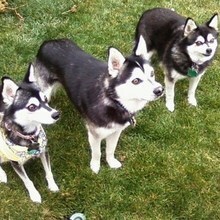 ﻿The Alaskan Klee Kai is a part of it’s pack. They require a good amount of face time with their owners and would prefer to follow them wherever they go. However, the AKK is cautious and will not immediately warm up to strangers or unfamiliar situations. They do have wonderful watchdog potential, as they are extremely loyal and alert as well as prone to barking. The Alaskan Klee Kai can become a high strung dog without the right level of activity. ﻿The Alaskan Klee Kai is an average shedder and should be brushed on a regular basis. They also should receive baths only when necessary. They are relatively easy to care for. One nice thing to note about the Alaskan Klee Kai is that it is not typical for it to have doggy odor or bad breath. So feel free to get close to your puppy and give it lots of love. The Alaskan Klee Kai has very few genetic defects to speak of. Some of the few health concerns associated with this breed are: Juvenile Cataracts, Liver Disease, Extreme Shyness, Factor VII Deficiency, Pyometra, Luxating Patella, Cryptorchids and Cardiac Issues Including PDA. Also, this breed is relatively young and other health issues could still arise. ﻿The Alaskan Klee Kai is an intelligent breed and is a fairly quick learner. The AKK requires a firm and consistent pack leader during training and would benefit greatly from obedience school. The breed has the propensity to develop “small dog syndrome', so it is imperative that the dog knows who's boss. ﻿The Alaskan Klee Kai is not a breed for those who live a sedentary lifestyle. This breed needs daily exercise and should be taken on a daily long walk. A larger area that provides space to play is fitting for the AKK, as their ideal day consists of more play than anything else! Mini Husky Puppies for Sale - Shipped Worldwide! Finding the right Mini Husky puppy can be dog gone hard work. PuppyFind® provides a convenient and efficient means of selecting and purchasing the perfect Mini Husky puppy (or Mini Husky puppies) from the comfort of your home, 24 hours a day, 7 days a week. Take advantage of our PuppySearch or leisurely browse our directory of hundreds of dog breeds, Mini Husky dog breeders, Mini Husky dogs for adoption, and Mini Husky puppy for sale listings with photos and detailed descriptions. Some Mini Husky puppies for sale may be shipped Worldwide and include crate and veterinarian checkup. Many Mini Husky dog breeders with puppies for sale also offer a health guarantee. With thousands of Mini Husky puppies for sale and hundreds of Mini Husky dog breeders, you're sure to find the perfect Mini Husky puppy.